DURHAM, N.H. - The University of New Hamsphire women's ice hockey team found itself entering the third period locked up with the University of Maine in a 2-2 tie on Saturday afternoon. Three minuets and 53 seconds in the period, junior forward Taylor Wenczkowski (Rochester, N.H.) took the puck off a faceoff win and rifled one home from the slot to break the tie and lift the Wildcats over the Black Bears by a final score of 3-2. The goal gave the Wildcats their fifth straight win, their longest winning streak of the season, and secured the season series against Maine with a 2-1-0 record against the Black Bears. Senior captain Kyra Smith (Littleton, Colo.) turned aside 27 of 29 shots, including 13 in the final frame, to prevent Maine from equalizing once again. Her record on the season is now at 12-7-2. The Wildcats are now over .500 for the first time all season, and have their first five-game winning streak since 2010. That streak ended at seven games, and lasted from October 15 to November 6 of that year. The Wildcats face more tough competition as they face #7 Boston College on Friday, February 8 evening at Conte Forum; puck drop is slated for 6 P.M. The 'Cats then return home Saturday, February 9 for an early evening, 4 P.M. matchup with the Merrimack Warriors, who currently sit two points ahead of New Hampshire in the Hockey East standings. - A back and forth first period stalemate was broken by Jenna Rheault (Deering, N.H.) 11:41 into the period, tallying her second goal of the year on a shot from the right faceoff circle on the power play, giving UNH a 1-0 lead. - New Hampshire added on to its lead 13:40 into the first as Julia Scammell (Truro, Nova Scotia) received a long pass in the slot from Taylor Wenczkowski, from behind the net. Scammell fired a shot towards the crease, and it was redirected by a Maine skate past the pads of Carly Jackson for a 2-0 UNH lead. - In the second period, with a new goaltender between the pipes, Maine answered back just five minutes into the period on a power play goal of its own. Anna Zikova's strike from the slot got past Smith and Maine was on the board, 2-1. - Another power play goal for the Black Bears came 15:12 into the second when Zikova fired another shot on net, which hit the pipe and rebounded to Daria Tershkina, who was able to poke the loose puck into the net. - Maine goaltender Loryn Porter stopped all 18 shots she faced in the second to keep the Wildcats off the board and the game tied through two. Maine tallied two power play goals off of five New Hampshire penalties (three power play attempts) in the period. 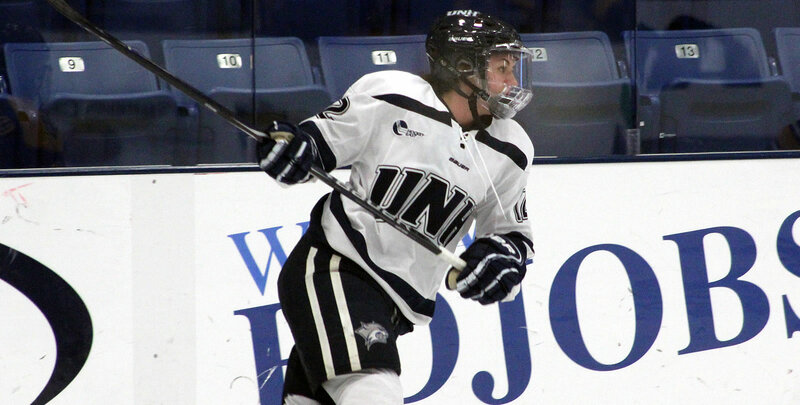 - New Hampshire responded three minutes into the final frame, as Lauren Martin (Cambridge, Ontario) won the faceoff directly to Wenczkowski in the slot and she buried the puck into the back of the net with a one-timer. - Smith turned aside all 13 shots in the third, keeping the Black Bears off the board despite another power play attempt.